Talking about race, faith, and sexuality isn’t always easy, but it’s needed now more than ever. King Avenue United Methodist Church is proud to welcome social justice activist and LGBT worship leader Darren Calhoun to Columbus on Sunday, October 1 at 7 p.m. to share his personal journey to bridge the divide that exists between racial and sexual inclusivity. Darren’s program, The Intersection of Racial & LGBTQ Identity, provides a welcoming and engaging voice in this difficult conversation space. Darren’s program will provide insights and practical ways the church can become a place where all feel welcomed and loved. Darren Calhoun is a justice advocate, worship leader, and photographer based in Chicago who works to bridge divides between people of differing perspectives through story and relationship. Intersectionality is his primary lens when facilitating dialogue and education about justice and inclusion for people marginalized based on race, gender, and sexuality. Darren co-lead the #ImSorry and #MakeLoveLouder campaigns at Chicago’s Gay Pride parades. In 2017 he led worship for the national gathering of the Gay Christian Network, and serves on the board of directors for the Center for Inclusivity and The Reformation Project. Currently, Darren is Worship Leader at Urban Village Church - South Loop, Associate Fellow for Racial Justice at Evangelicals for Social Action, in addition to owning Darren Calhoun Photography. He's also an extrovert who loves hugs. 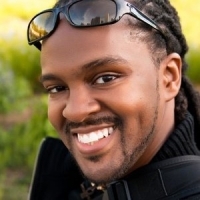 Visit his site at DarrenCalhoun.com to learn more about his work. This program is part of King Avenue’s Changing the Conversation Speaker Series, which features Christian thought leaders striving for inclusion of traditionally-marginalized people and communities. from Darren – "In particular, check out the title track of the album All Belong Here as it may be a great tie-in to our upcoming event." Sunday, October 1, 2017 at 7 p.m.
King Avenue United Methodist Church... We invite, welcome, and honor all people and nurture them to grow in service with Christ.